The license costs a one-time fee, you pay only once and does not expire. There are NO annual fees. The license fee can send unlimited emails. There are NO additional costs when sending newsletters. To purchase Mailing List Studio have filled in the form below with your details. The VAT will be calculated on the next page according to international rules. ACCEPTING this statement will authorize 'PESARO SYSTEM to display your name on the map customers. Map of customers is a summary graph that displays a map of the world with indicated flags that correspond to users that use products PESARO SYSTEM. By clicking on the corresponding flag, a box appears containing information Company Name, City and Province. You WILL NOT receive other data. NOT ACCEPTING this information does NOT display it will report the information but, also to those who have accepted the information, a flag WITHOUT name. Be sure to carefully read and understand all the rights and restrictions described in this EULA PESARO SYSTEM with the End User. The user will be asked to consider and accept the terms and conditions of this Agreement. This Agreement is an agreement between you (either an individual or a single entity) and PESARO SYSTEM for software PESARO SYSTEM attached which includes computer software and may include media storage associated materials printed and online documentation or electronic (SOFTWARE). By installing the software, you agree to be bound by the terms of this Agreement. If you do not accept the terms and conditions of this Agreement, then should not install or use the SOFTWARE. - to have read the Contracted present. - to affix own signature, therefore to accept the terms and the conditions of the Contract. - to have tried the product in a version of the versions TRIAL, SHAREWARE or FREEWARE. - be aware of all the capabilities and limitations of the product. - assume all responsibility, and thus exclude PESARO SYSTEM, for any damage that may arise from making use of software. The Product Software and protected from the laws and from the international essays on the copyright, over that from other laws and essays on the intellectual Property. The Product Software is granted in license, you're not sold. NOTE: The terms of the possible papery copy of the Contract enclosed to the Product Software will prevail on the terms of Contracted qualsivoglia in line retrieved inside the Product Software. Pesaro System grants to the consumer, what physical person, a personal license and not exclusive to perform and to use copies of the Product Software to the solo purpose to shape, to develop and to test the products software developed to operate with any product for operating system of Microsoft. The consumer can install copies of the Product Software on a boundless number of condition computer that you're the only one to use the Product Software. If the consumer is a juridical person, Pesaro System grants the right to designate a physical person inside own organization that has the right to use the Product Software in the way above specified to the consumer. The Contracted present grants to the consumer, what physical person, a personal license and not exclusive to effect and to use a boundless number of copies of qualsivoglia documentation, to condition that such copies are exclusively used for personal purpose and are not republished or you distribute. The consumer can also memorize or to install a copy of the Product Software on a device of memorization, what a server of net, entirely used for installing or to perform the Product Software in the computers used by an end user provided of valid license in conformity to the dispositions of the article 1.1. A same license for the Product Software cannot be shared or used in concomitance by other end users. In case of Fine-license, Pesaro System grants to the consumer, what physical or juridical person, an exclusive license to perform and to use copies of the Product. The consumer can install copies of the Product Software on a boundless number of condition computer that belongs to the same Firm. If the Product Software brings the label of updating ("Upgrade"), the consumer, to be able to use the Product Software, has to own a to regulate user licence of a product qualified by Pesaro System as fit to be integrated from an updating. A Product labeled Software as updating it replaces and/or it integrates the product that constitutes the susceptible base to be integrated through updating. The final product adjourned resultant from the integration can be used only in conformity to the conditions of the Contracted present. If the Product Software and an updating of a component of a packet of programs granted software in license to the consumer as produced single, the Product Software can be used and transferred only as part of the packet considered single product and from this you cannot be separated to be used in more computers. If the Product Software brings the label of Version DEMO, SHAREWARE or FREEWARE, the consumer can memorize, to use, to copy or to distribute such Product Software in boundless number. All the versions DEMO have temporal limitations. All the versions SHAREWARE or FREEWARE don't have temporal limits and they exactly correspond to the complete versions except also functionalities. To try the product with the versions of DEMO, SHAREWARE or FREEWARE before purchasing it. The ownership and the rights on the intellectual Property related to the Product Software (included ivi, but not limitedly to, every image, photo, animation, video, audio, music, text and "applet" integrated to the Product Software), the enclosed printed material and any copy of the Product Softwares, are of Property of Pesaro System or its suppliers. The titolarita and the rights on the intellectual Property related to contained to which the consumer can enter through the use of the Product Software, they are of Property of the respective holders and you/they can be protected from the copyright or from other laws and essays on the intellectual Property. From the Contracted present some right doesn't spring to use such contents. Pesaro System expressly reserves not him all the rights granted by the Contracted present. Free services such as antispam and geolocation, are offered by external companies. For this reason PESARO SYSTEM can not guarantee the continuity of such services indefinitely. In case of power PESARO SYSTEM will strive, to the extent possible, to replace them with services of other companies, always free. PESARO SYSTEM is free to decide if and when to activate or deactivate the free services. Websites of external companies are not manageable by PESARO SYSTEM, which is not responsible for the content. If these sites stop working, or not working properly, PESARO SYSTEM is not responsible and can not intervene to correct errors. For any dispute arising from this contract, the parties purport conventionally competence in favor of the Court of Pesaro. The right of withdrawal is the possibility for a Contracting Party to unilaterally dissolve a contract, estinguendone all obligations arising therefrom , without the consent of the other party and without facing penalties. The unilateral termination of the contract must be communicated in writing to the other party within a period specified by law , or other term, provided more favorable , established in the contract, a clause in the exercise of the right of withdrawal. The Council Directive 85/577/EEC of 20 December 1985 to protect the consumer in respect of contracts negotiated away from business premises , introduced the right to cancel within a minimum period of seven days, and has been transposed in Italian . Who buys an object, like a subscription or has 7 days to cancel the contract without penalty who signed . It should be clear, however, that the right of withdrawal does not apply to any goods purchased or previously having had the vision and ability to take note of all the features, such as FREEWARE versions : rethinking is not recognized as a right. If the consumer has already used the service purchased, either totally or in part, the right of withdrawal can not be applied. 1. I dati personali da Lei/Voi forniti o acquisiti nell'ambito della nostra attivita' saranno oggetto di trattamento improntato ai principi di correttezza, liceita', trasparenza e di tutela della Sua/Vostra riservatezza e dei Suoi/Vostri diritti. 2. Il trattamento di tali dati personali sara' finalizzato agli adempimenti degli obblighi contrattuali o derivanti da incarico conferito dall'interessato ed in particolare all'invio telematico di ulteriori informazioni commerciali e materiale pubblicitario sulle novita' dei prodotti dei titolari di questo sito o eventuali fatture. 3. Il trattamento potra' essere effettuato anche con l'ausilio di strumenti elettronici con modalita' idonee a garantire la sicurezza e riservatezza dei dati. 4. Il conferimento dei dati e' obbligatorio. L'eventuale rifiuto a fornirci, in tutto o in parte, i Suoi/Vostri dati personali o l'autorizzazione al trattamento potrebbe comportare la mancata o parziale esecuzione del contratto ovvero la mancata esecuzione dell'incarico. 5. I dati potranno essere comunicati, esclusivamente per le finalita' sopra indicate, a soggetti determinati al fine di adempiere agli obblighi di cui sopra. Altri soggetti potrebbero venire a conoscenza dei dati in qualita' di responsabili o incaricati del trattamento o in qualita' di gestori e manutentori del sito stesso. In nessun caso i dati personali trattati saranno oggetto di diffusione. 7. Il titolare del trattamento dei dati personali e' PESARO SYSTEM con sede in Via Della Rinascita, 13 - 61122 Pesaro PU. Il responsabile del trattamento dei dati personali e' Gabriele Marchionni. Mailing List Studio Since 2003, the leading software for managing mailing lists and send out newsletters. 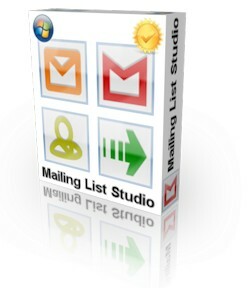 Mailing List Studio is the first software for managing mailing lists. In recent years, the software has never ceased to improve by listening to the advice of the users users. Since the first publication in today thousands of users around the globe use Mailing List Studio for sending newsletter.